The penalty has been imposed by the Information Commissioner’s Office (ICO) over the high-profile cyber attack occurred in the company last October, which allowed hackers to steal the personal data of its 156,959 customers "with ease." "Today’s record fine acts as a warning to others that cyber security is not an IT issue, it is a boardroom issue. Companies must be diligent and vigilant. They must do this not only because they have a duty under the law, but because they have a duty to their customers." As a result, the hackers attacked three vulnerable web pages using a well-known hacking technique called SQL injection and got hold of the customers’ data. 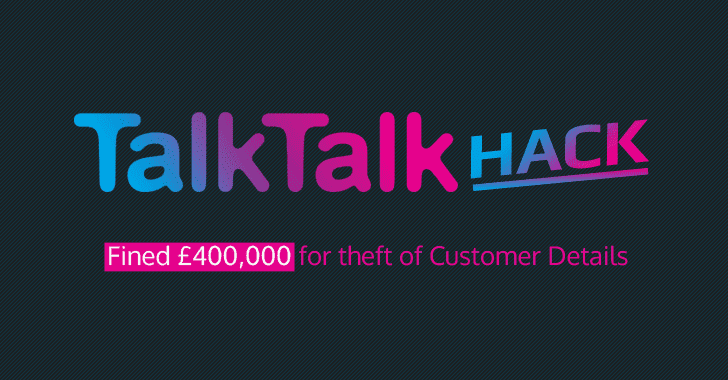 TalkTalk has been attacked several times last year. Before the October cyber attack, the company’s system had been breached twice — first in July and then in September 2015. But the telecom did not learn anything from its past mistakes. In response to the ICO’s decision, TalkTalk has said that it is disappointed with the fine imposed by the ICO, but it will gladly hang its head in shame.